Want ice cream but you didn't plan ahead and get it going? Just too busy? No ice cream maker? I've got the answer — and it's done in an instant. As in a minute or so! You need 3 things: frozen fruit, liquid, and a high-powered blender like a Vitamix or Blendtec. It's possible this can be done in a food processor or a lower end blender, too. The idea behind this is to use as little liquid as possible to facilitate blending the frozen fruit in the blender. Your result will be soft serve and delicious ice cream! Play around with the amounts to suit your preferences and of course, the appliance you're using. An appliance with less power will need more liquid and the results may be more like a smoothie than ice cream (but still delicious). 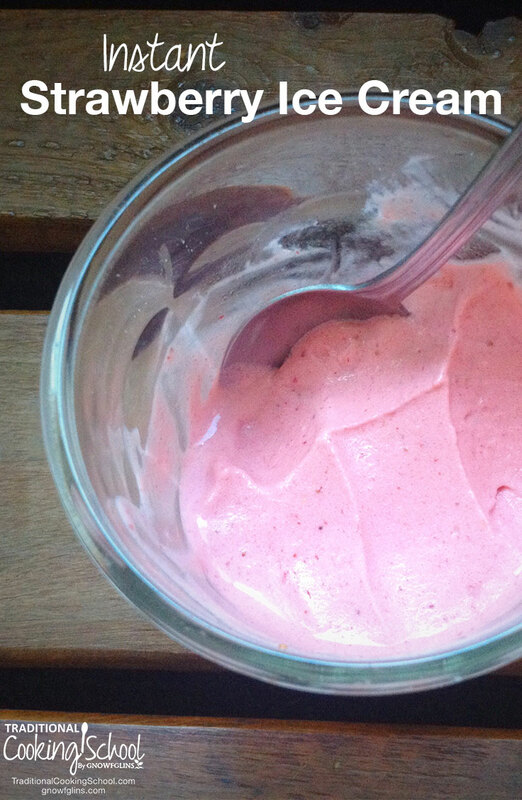 Though I'm sharing strawberry ice cream, you can use any berry or frozen fruit. I try to avoid using heavily seeded berries — like blackberries and raspberries. But if that's all you've got, it makes delicious ice cream, too. Even with the seeds! Want ice cream but you didn't plan ahead and get it going? Just too busy? No ice cream maker? I've got the answer -- and it's done in an instant. As in a minute or so! You need 3 things: frozen fruit, liquid, and a high-powered blender. Serves 4 to 5 (1-cup servings). Combine all ingredients in the order listed in the Vitamix or Blendtec container. Start the speed on low and increase slowly as the fruit gets broken up fully and the mixture starts circulating pretty freely. If using the Vitamix, use the tamper while blending to help the mixture circulate. If using the Blendtec, stop and scrape sizes as needed or use the Twister jar with lid that has side scrapers built in (and a smaller batch). When there are no longer chunks of fruit and it’s all smooth, it’s done. *You can use a liquid sweetener such as honey, just reduce the cream or milk accordingly. Dry sweeteners should be whizzed fine in a blender beforehand to create a powdered sugar texture. 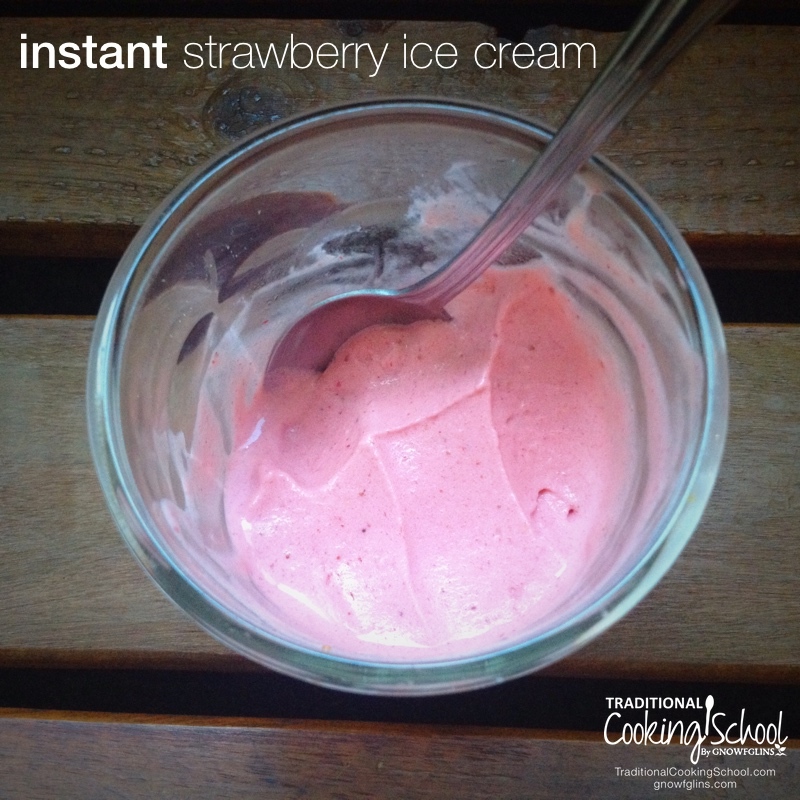 Have you made instant ice cream before? What's your favorite fruit combination? I’ve always used honey to sweeten. Favorite is peach ice cream. Earlier today, for lunch, I had cantaloupe and strawberry ice cream made with kefir. I hadn’t read this yet so it was nice to see I’m not the only one who considers this a yummy ice cream!! Wardee – first want to say I love your blog and your service! I make my basic “ice creem” from frozen bananas. I feed them through my 1976 vintage Champion juicer*, and, voila! soft-serve. I’ve made ice creem this way with other fruit as well, but I usually just stick to bananas. We usually do home made almond milk, frozen bananas and raw cacao. DELISH! We made the best dairy free dessert the other day…frozen bananas and frozen black raspberries blended in the food processor with just a touch of coconut milk…maybe two tablespoons…just to soften….it was delicious! This looks great! I do this using coconut milk (or cream) and frozen fruit, usually mixed berries. I gave up sugar a couple of years ago and never used a replacement, so the fruit alone is plenty sweet enough for me. Nice to know it will also work with other liquids……. I learn so much from all you gals! I just wanted to say thanks. I’m not a “prepper” as I don’t believe in it. But all these fabulous recipes, I love ’em!! So thanks!! you can’t just start with powdered sugar? Cathy, yes, but we prefer to take a less refined sweetener and whizz it in a blender to that consistency. I’ve been doing this since I don’t have an ice cream maker, and another alternative to frozen fruit is to freeze milk in an ice cube tray. Then you can make chocolate, vanilla, or any other flavor, too. I’m confused, what do you mean by ‘whizzed’? 1 frozen banana, 1 tbsp. cocoa, handful of fresh mint, 2/3 cup almond or coconut milk. Yummy chocolate mint ice cream! You just gave me an idea how to use some of my Chocolate Mint I’m growing in the garden. This instant ice cream sounds wonderful. I can’t wait to try it. I love blueberries and peaches together. Thanks for the recipe! It does nicely in my Ninja, too. I freeze goat Kefir in ice cube trays and bananas and throw them as well as chia and flax seeds! I find it a good way to sneak stuff in to children’s diet :). Strawberry banana is a favorite! With peaches and blueberries a close second! Thanks for all the great info!!! Hi Thanks for this.. so is that it? just blend and the icecream is made? or do we have to freeze it again? This recipe came just at the right time! I needed a recipe I could make with no added sugar and I this one will be fabulous! Thank you Wardee. We make “rainbow ice cream” similar to this plus a veggie of my kids’ choice. It’s a great way to get them to eat spinach, I swear you can’t even taste it. The kids choose ingredients from the colors of the rainbow (mango and pineapple are usually the base) and must include at least one veggie. Spinach works great in this one to get the awesome folate from fresh spinach (my 7 year old will not eat fresh spinach in a salad). Ingredients are any frozen fruit, 100% juice or nut milk of choice, and veggie of choice…usually spinach but kale and carrots work well too. If using nut milk I add honey (with juice it doesn’t need additional sweetener). The kids love it and feel empowered by getting to choose the veggie. I love ice cream, but hate the calories! This is a great way to have a guilt free dessert. It’s probably only true for a few of us, but I prefer far less sweetener. Oh, wait. I just remembered that the berries I used were unusually sweet ones from Providence Farm. I enjoy nuts whirred in during the last few seconds of blending. I added walnuts to this batch. And your recipe includes vanilla, and it was a tasty upgrade! I have made this style of ‘ice cream’ for a cold, refreshing treat with frozen bananas and mango.. . very yummy! I use my small ninja blender.